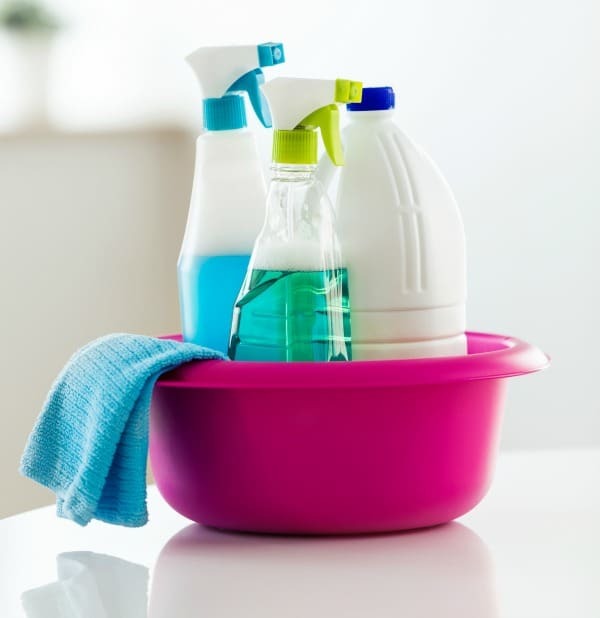 A Printable Cleaning Checklist is a simple way to stay organized with household chores. Busy moms know how many chores need to be done and it can be hard to remember everything with out a checklist in hand! Cleaning house seems like an endless task because it is. The cycle of cleaning just never ends. Some chores need to be done almost daily and others can be done weekly or even monthly. I have trouble remembering to do the weekly and monthly chores without a little help. It is always easier to keep up with the cleaning then it is to let it go too long. When I forget about little tasks they end up taking so much longer to accomplish. 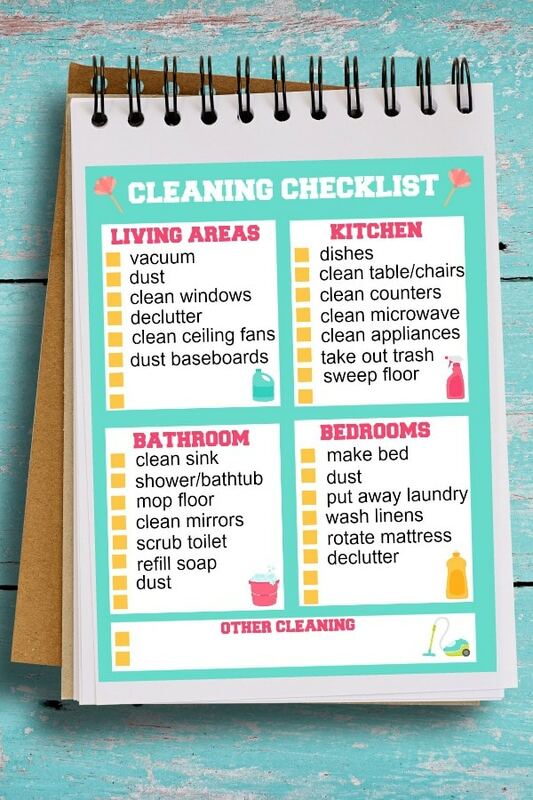 Keeping this printable cleaning checklist handy in my cleaning closet helps keep me on track. The only thing better than a printable cleaning checklist is a reusable printable cleaning checklist. 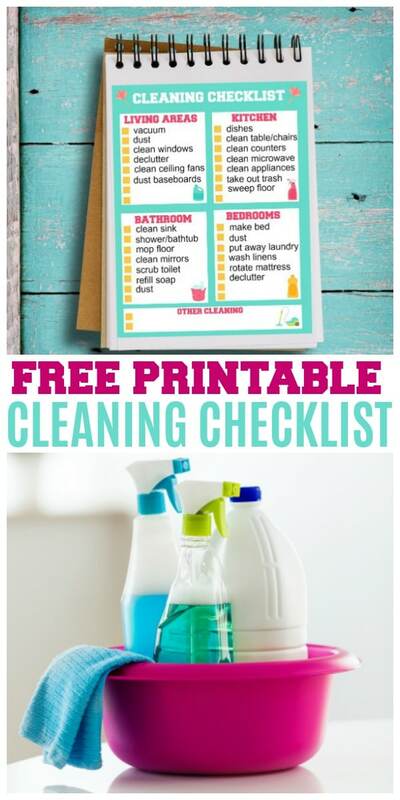 It is really easy to make this free printable cleaning checklist reusable. If you have a personal home laminator it is a breeze. Just laminate the cleaning checklist and keep it on a clipboard with a dry erase marker nearby. Mark off each chore as you complete it and each week you can start over! It may not make cleaning fun, but it will definitely help you stay organized. This printable cleaning checklist covers the basic chores for the home. These the are activities that many people do each week or biweekly. The kitchen, bedrooms, living areas and bathrooms are covered on this list. There is also an extra cleaning box for you to add other items you would like to accomplish. Almost every home has a living room and many have a living room and a family room. Each family uses these common spaces differently. These spaces get a lot of use in some homes and require quite a bit of attention. In my home the living room gets the most use and the family room use is just occasional. I typically clean parts of the living room daily and weekly and the family room weekly to biweekly. The kitchen is a space that typically requires a LOT of work. It is used many times during the day and there always seems to be something that can be done in the kitchen. The hard part about the kitchen is that the work never stays done for long. Just when I think I have the kitchen spotless someone will walk in and make a smoothie! There are also a lot of extra cleaning chores to be done in the kitchen. The oven, microwave, dishwasher and refrigerator all require extra cleaning from time to time. I have found it easier to take a day each month to clean out the inside of all the appliances. The bathrooms in my home stay cleanest when the whole family pitches in EVERY SINGLE DAY. 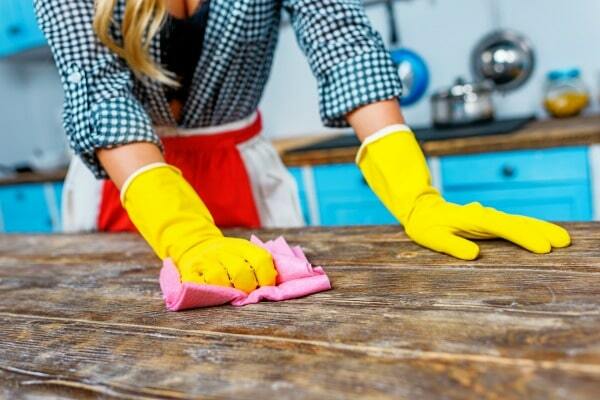 It is easy to grab a disinfectant wipe and wipe down the counters and sinks each day. I can put some toilet bowl cleaner in the toilets every couple of days so that the toilet stays sparkling clean. Once a week I will focus on cleaning out the showers and tubs and cleaning all the mirrors. I like walking into a clean bathroom and have found out the hard way not to let the bathroom cleaning get out of hand. The bedrooms seem to stay cleaner than the rest of my house. Let me reword that to say the adult bedrooms stay cleaner, LOL. Keeping the bed made and the laundry put away seems to make the room appear clean. 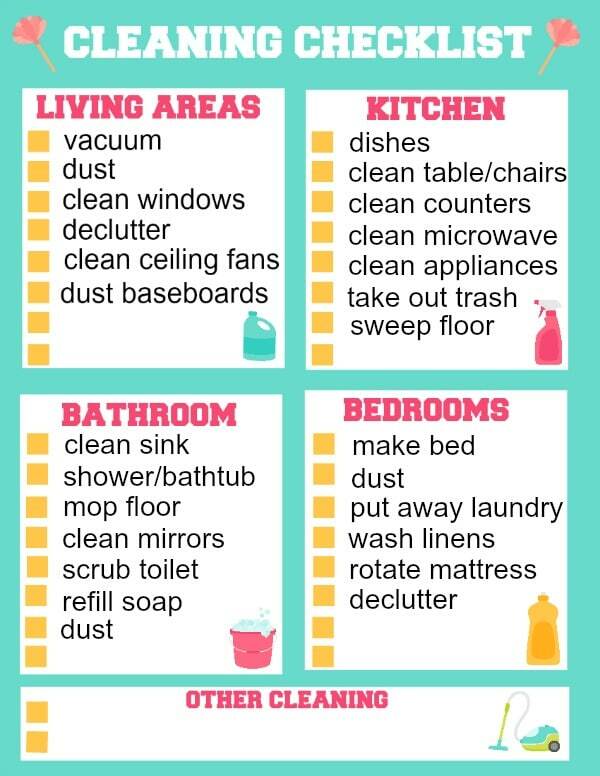 I will dust and vacuum every week and make sure the room stays decluttered. It is amazing how keeping the house decluttered keeps it so much tidier and reduces my cleaning load. I love free printables and this printable cleaning checklist has really kept my cleaning on target. If you love to stay organized like I do then you will want to get your hands on these other printables! Be sure to SHARE this post with your friends so they can get their own printable cleaning checklist!